La Alpins majestet i Sveits forføre deg på en spektakulær 4-dagers tur som veier gjennom landlige skjønnheten i Italia og Liechtenstein. Fra Zürich, vent til idylliske alpinbyer som St Moritz, Zermatt og Lugano, og nyt deres fantastiske natur. Cruise kysten av Italias søte Comosjøen; se de imponerende historiske monumentene til Vaduz, Liechtensteins sjarmerende hovedstad; og beundre den visuelle størrelsen på Sveits rullende landskap. Transport med luftkondisjonert buss og overnatting i 4-stjerners hoteller er inkludert på turen. Start din episke reise gjennom Alpine regionen i Genève og klatre ombord på en romslig, luftkondisjonert trener for å oppdage noen av Sveits mest imponerende natur- og kulturminner. Nyt den ekstra opplevelsen av å besøke den romantiske kysten av Comosjøen i Italia, og den pittoreske hovedstaden i Liechtenstein. Transport med luksusbuss, overnatting på 4-stjerners hoteller og måltider angitt av reiseruten er inkludert i reisepakken. Dag 1: Genève - Montreux - Zermatt (D) Start dagen med en bytur i Genève, avgang fra Gare Routiere, byens sentrale bussterminal. Se hvor Europas europeiske sete har sitt hovedkontor, stopp ved rådhuset og ta en pause for å beundre naturen rundt Genfersjøen. Legg igjen Genève bak for en kjøretur til innsjøbyene Lausanne og Montreux, og fortsett deretter til storybook Chillon Castle for et foto stopp. Venturing gjennom Valais, Rhône-elven, overfører til et tannhjulstog i Täsch og renner opp til Zermatt, en tysktalende feriested ved foten av Matterhorn-fjellet, hvis slående topp er et symbol på Sveits. Dag 2: Zermatt -Täsch - Lugano (B) Morgenen er din til å bruke som du vil. Hvis du er ute etter flere synspunkter, ri på tannhjulet opp det snødekte Gornergrat-fjellet (egen bekostning), eller bare rusle gjennom byen som handler for knickknacks og beundrer de sjarmerende gamle gårdshusene. På ettermiddagen, ta toget til Täsch og ta ombord bussen for en tur over den fantastiske Nufenen Pass. Kryss inn i den italiensktalende delen av Sveits og ankomme i hagen byen Lugano, ligger ved innsjøen Lugano og omgitt av Lugano Prealps. Dag 3: Lugano - Comosjøen - St Moritz (B, D) Etter ditt opphold i Lugano er det på tide å treffe veien til Italia. Ta en naturskjønn rute over grensen og kjør langs de fortryllende villaene langs Comosjøen, et berømt feriested (og for øvrig en kjendismagnet). Så sug opp den italienske sjarmen til Menaggio og Chiavenna i den vakre Breggaglia-dalen. Skriv inn Sveits ved hjelp av Castasegna. Hairpin svinger over Maloja Pass til krystallblå Lake Sils og Lake Silvaplana, og leverer deg til den berømte fjellbyen St Moritz på sen ettermiddag. St Moritz ligger i rolige Alpine toppmøter, og har vært to vinter-OL, og er hjemsted for en av de dyreste skistedene i verden. Utforsk på fritiden og nyt middag med gruppen din om kvelden. Dag 4: St Moritz - Vaduz - Zürich (B) Pakke opp og ta en morgenkjøring over Julier Pass til Chur, den eldste byen i Sveits som har en bosetningshistorie på over 5000 år. Fortsett en time nordover og krysse Liechtenstein-grensen til Vaduz, hovedstaden. Beundre mektig Vaduz Castle, et nydelig kongelig palass som ligger på en skogkledd utkikk med utsikt over dalen. Før du kan si, "Hvor liten er dette landet? ", Vil du være tilbake på sveitsisk territorium underveis til Zürich. Nyt utsikt over Sveits landlige gårdområder på ettermiddagsturen gjennom Toggenburg-regionen, og ankomme i sentrale Zürich om kvelden, hvor turen din vil ende. Enjoyed our four day tour immensely. Stopped at Zermatt and took the train to the Gornergrat during a spectacularly clear day, visited Lake Lugano for a night, stopped by Lake Como for lunch, spent a night in St. Moritz and ended up in Zurich. The tour guides were great, the coach was empty and the weather cooperated. Would do it again! If you only have a limited amount of time to see Switzerland, I highly recommend this trip. It is well thought out. The guide Philip spoke five languages, and knows pretty much everything about everywhere we went. As he coach traveled through Switzerland he had an ongoing presentation about every location we were passing. Zermatt, Lake Lugano, St. Moritz were the hotel locations and all were truly outstanding. We were fortunate that the view of the Matterhorn was as clear as could be on the day we were there. Have a day in Geneva on the front end, as the time to visit Geneva itself on the first day is only a couple of hours. The trip ended in Zurich at the train station. We stayed in a hotel near the train station and then took a very early train to Salzburg. Very affordable train that took about 5 hours through beautiful countryside. Get the business class seats for a very modest upgrade in price. Our tour guide, Philippe, was quite excellent! His stories were interesting, he gave us a lot of information while we were on the road, and he always made sure we were well accommodated (both of us who were traveling in my party are vegan and he took that into account for the meals included in the tour). The lodging was always excellent, very comfortable, and our luggage was always delivered to our hotel rooms and loaded back onto the bus for us, which made it extremely convenient! Overall, I think it's a great way to experience many different aspects of Switzerland in just a few days! An excellent way to see the hi-lites of Switzerland in 4 days. This was an amazing trip. So much covered in 4 days. The coach, hotels, and meals were all 5 stars. Our tour director Michael was a gem. Full of information and antidotes. Switzerland was picture perfect. By far the most beautiful country in Europe. The Matterhorn was breathtaking. I enjoyed the itinerary, hotels, tour guide, and bus driver's competence. The only thing I didn't like was starting at a bus station and ending at a rail station. I flew in and out of Switzerland.The Geneva bus station was a harrowing 40 taxi ride on narrow crowded streets, from my hotel which was near the Airport. Getting to the Zurich Airport from the rail station wasn't an easy journey for a first time to Europe traveler. So having the option to get on the bus near the Geneva Airport and ending the tour near the Zurich Airport would have been much preferred and a lot less stressful. I loved all of little towns and villages that we saw. They were beautiful and were like a Swiss storybook. The guides were great, good mix of talking and quiet time on the bus. I did not like the little restaurant at the top of the pass and thought that we should have gone down the mountain, but that is not enough to downgrade the tour. All of the rest of the food was great. This was a trip you will never forget...well-organized, with a superb tour guide in Phillipe. The cities and venue have to be the best of Switzerland. In fact, we found ourselves saying each morning, today can't be better than yesterday, but then, it was. 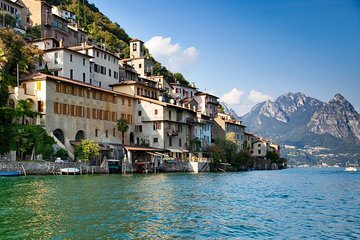 Lugano and the surrounding area was my personal favorite, but the beauty of the regions you see will have you snapping hundreds of photos each day. Not mentioned that much in the other reviews is the food for breakfasts and dinners at the various 4-star hotels - just outstanding. Also, not mentioned, but important to me, was that all 3 hotels either had upscale fitness rooms or access to a fitness facility free of charge in all cases. On the tour itself, there was plenty of time for stopping and strolling - we never felt rushed, but also, never bored either. The other people we met on the tour were awesome maybe our luck, but all very nice people and some, with whom, we have exchanged contact information to become friends and maybe even future travel companions. All in all, it couldn't have gone better. You will see the best of the best and Switzerland is just such a memorable and scenically beautiful country to visit! This was an amazing trip. Found it online through Viatour. The tour company is Hans Meyer Tours out of Zurich. The places we stopped were perfect. Phil is a great tour guide. He knows his history and is a native of this beautiful country. We saw so much, Geneva, Zermatt, Logano, St Mortiz. The hotels were all amazing. Large rooms, even for US standards. Great food. I highly recommend this tour if you want a four day glimpse into this lovely land.